Seen at Gourock on Sunday afternoon, CalMac's HEBRIDEAN ISLES had spent the morning steaming up and down the east coast of Arran after being unable to berth at Brodick. 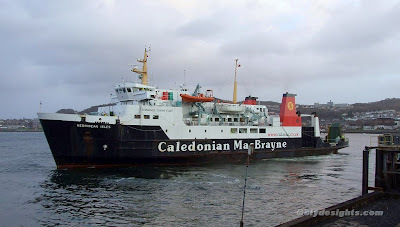 Her presence on the Clyde was required after the regular Arran ferry, CALEDONIAN ISLES, suffered major engine problems and had been unable to serve the island since Saturday morning. In the event, HEBRIDEAN ISLES was also unable to provide a service owing to a number of things, resulting in her heading for an overnight berth at Gourock.